LA based DJ Prophet, holds it down blending old school hiphop with modern tracks at weekly residencies in Hollywood & DTLA, co-hosts the Bestbuds Show & The Dr. GreenThumb show every week on Breal.TV and drops weekly mixes on Kday 93.5fm radio every Sunday from 2-4pm. 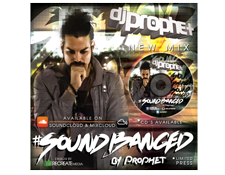 Download and turnup the latest Prophet beats and weekly mix collection. Sign up to get on DJ Prophet's weekly guestlists and stay up to date. Need to get in touch with a badass DJ? Want that smooth sound off hiphop with hits from all decades? © DJ Prophet | deejayprophet.com 2014. Web Design by RECREATE media.